Paravalvular leaks (PVLs) are a well-recognized complication of prosthetic valve replacement. Perivalvular prosthetic regurgitation causes significant morbidity and is associated with high perioperative mortality if open surgical repair is required. PVLs manifest with symptoms of congestive heart failure, hemolysis, or in most cases, the combination of both. In recent years, the development of imaging and device techniques significantly shortened the duration of fluoroscopy and procedure success was achieved. Percutaneous transcatheter closure of PVLs with a specific device causes symptomatic improvement. We present a case of transcatheter closure of aortic paravalvular insufficiency with amplatzer duct occluder 2 device. Paravalvular leaks (PVLs) are common complications of patients who had a history of valve replacement. It can be seen in 2% to 10% of prosthetic valve in the aortic position. Redo valve surgery is the gold standard therapy, but carries high risks for the patients. Morbidity-mortality rates are high after a surgical reoperation especially on the vast majority of elderly patients. With the advancement of device technology and imaging modalities, interventional cardiologists have begun to perform percutaneous valve interventions successfully. 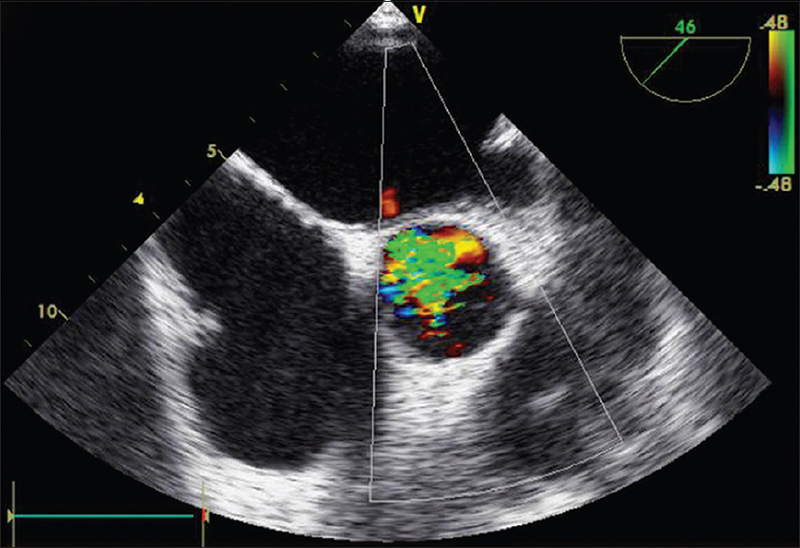 We report our experience with percutaneous transcatheter closure of PVL in a patient who had a history of recurrent hospitalizations diagnosed as decompensated heart failure. A 57-year-old male patient who presented with New York Heart Association class III-IV dyspnea and massive ascites, was admitted to our clinic. He had a history of mitral valve replacement for serious mitral insufficiency and aortic valve replacement for severe calcific aortic stenosis 3 years ago. He had repetitive hospitalizations due to decompensated heart failure for a period of 3 months. On examination, he had a regular pulse rate of 82 beats/min, and blood pressure of 120/70 mmHg. The cardiopulmonary examination revealed a grade 2/6 early diastolic decrescendo murmur, clear prosthetic click and bilateral crackles in the lung bases. He had massive ascites, pretibial and scrotal edema. 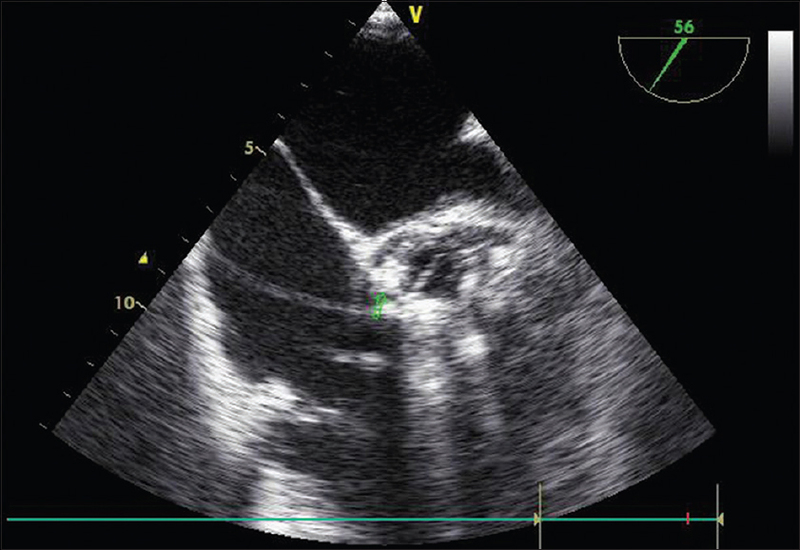 The transthoracic and transesophageal echocardiography (TEE) showed mildly decreased left ventricular systolic function with left ventricular hypertrophy and aortic metallic prosthetic valve with severe paravalvuler insufficiency at the edge of the sewing ring [Figure 1] and [Figure 2]. He denied the options of redo operation and percutaneous closure of the defect were discussed in every detail. Then, patient agreed to attempt percutaneous intervention. Warfarin was stopped before the procedure and his international normalized ratio at the time of the procedure was 1, 9. The procedure was performed under TEE guidance using general anesthesia. Right femoral artery puncture was performed, and paravalvular aortic regurgitation was evaluated by aortography. Leak was passed by a hydrophilic terumo 0.35 inch guide wire and 5 F delivery catheter was placed into left ventricle. Paravalvular aortic leak diameter was calculated using TEE and 4 mm amplatzer duct occluder (ADO) II was chosen. ADO II was loaded into the delivery system and left ventricle side was opened first, and aortic side was opened secondly. During the opening of aortic side, disappearance of leak was observed, and device was released [Figure 3]. Complete disappearance of leak was confirmed by aortography. There was not any complication, and the patient was discharged from the hospital after 2 days. With increase in elderly population, the normal of prosthetic valves also increases. Nowadays, echocardiography has demonstrated more and more prosthetic valves leakage and hence, the cardiologists can recognize such problem easily. The present report is an example of a successful repair of paravalvular aortic prosthesis leakage using ADO II. Paravalvular aortic insufficiency is a complication of surgical aortic valve replacement and it is associated with poor prognosis. As in our case, paravalvular aortic leakage causes the persistence of congestive heart failure, and percutaneous aortic leakage repair is a good alternative to the redo surgery. Ruiz CE, Jelnin V, Kronzon I, Dudiy Y, Del Valle-Fernandez R, Einhorn BN, et al. Clinical outcomes in patients undergoing percutaneous closure of periprosthetic paravalvular leaks. J Am Coll Cardiol 2011;58:2210-7. Miller DL, Morris JJ, Schaff HV, Mullany CJ, Nishimura RA, Orszulak TA. Reoperation for aortic valve periprosthetic leakage: Identification of patients at risk and results of operation. J Heart Valve Dis 1995;4:160-5. Webb JG, Pate GE, Munt BI. 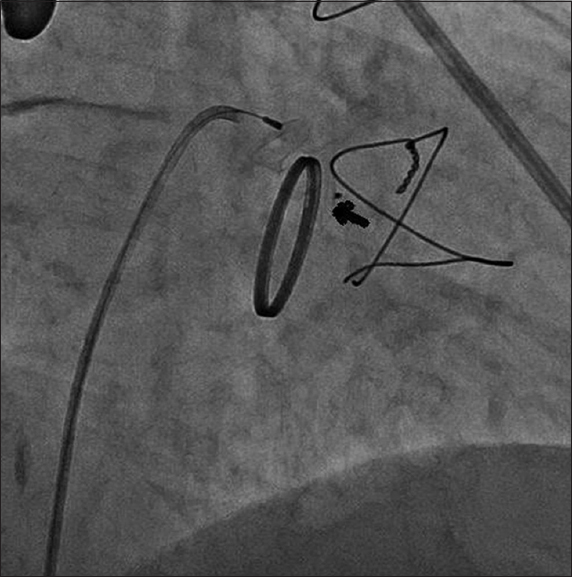 Percutaneous closure of an aortic prosthetic paravalvular leak with an Amplatzer duct occluder. Catheter Cardiovasc Interv 2005;65:69-72. Hildick-Smith D, Behan MW, De Giovanni J. Percutaneous closure of an aortic paravalvular leak via the transradial approach. Catheter Cardiovasc Interv 2007;69:708-10. Pate GE, Al Zubaidi A, Chandavimol M, Thompson CR, Munt BI, Webb JG. Percutaneous closure of prosthetic paravalvular leaks: Case series and review. Catheter Cardiovasc Interv 2006;68:528-33. Sorajja P, Cabalka AK, Hagler DJ, Reeder GS, Chandrasekaran K, Cetta F, et al. Successful percutaneous repair of perivalvular prosthetic regurgitation. Catheter Cardiovasc Interv 2007;70:815-23. Nietlispach F, Johnson M, Moss RR, Wijesinghe N, Gurvitch R, Tay EL, et al. Transcatheter closure of paravalvular defects using a purpose-specific occluder. JACC Cardiovasc Interv 2010;3:759-65.